This innovative, new cooling vest is ideal for casual wear and covers more surface area with a soft, high quality fabric that stretches to comfortably fit the body. This vest includes a 12 piece GlacierPack set that’s ideal for office, home or recreational use and features a hermetically sealed barrier for easy cleaning and sterilization. An innovative union of form and function, the new Glacier Tek Flex Vest features soft, high-quality fabric that stretches and moves with the wearer. 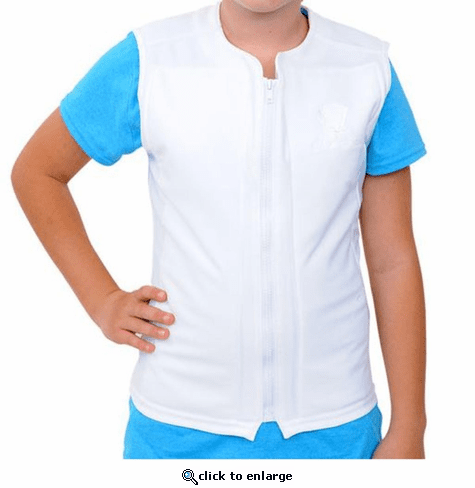 Designed to provide cooling comfort in unpleasantly warm conditions, the vest is styled to look like every day casual wear, with 12 cooling packs that tuck discreetly into specially designed pockets. Perfect for clean environments such as offices, homes or for recreational use, the Flex Vest is an important accessory when the temperature gets too warm.